From Big Time Gaming, Temple Quest Spinfinity is a visually stunning slot that takes you deep into the jungle and Aztec ruins to hunt your winnings. If nothing else does, the backdrop of clear blue skies and flowing waterfalls will put a smile on your face. Although this slot only has a 5x4 reel setup with 40 pay lines on offer, it feels like a whole lot more. Not only is the base game full of possibilities with Mega icons and wilds, but the Free Spins Feature is where the ‘Spinfinity’ title comes from. Deposit today and see if you can experience endless amounts of free spins. You can visit here about Easy Slots! As soon as you open this game you’ll immediately be immersed in the jungle with the sounds of birds chirping and water flowing. The 5x4 reel gameboard is filled with low to medium value symbols which will keep your bankroll ticking over. Look out for A, K and Q symbols for your low wins and green gems, red and blue parrots and Aztec masks symbols for your medium wins. * WILDS – The WILD symbol substitutes for all symbols except the SCATTER. 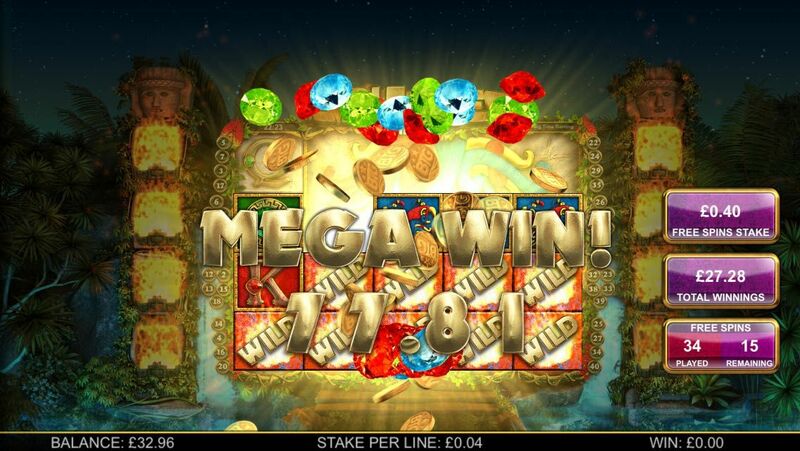 * MEGA ICONS – The MEGA ICONS will reveal a symbol that matches with the other reels and creates wins. These icons have up to 16 individual positions to give you a better chance of winning. * FREE SPINS FEATURE – To activate the Free Spins FEATURE, the Mega Icon will land on the reels and reveal the Free Spins. Each individual position on the Mega Icon will determine how many free spins you receive. Up to 9 can be awarded. During Free Spins, the first reel will stay the same as the base game whilst the other four reels transform into a Mega Icon. You can re-trigger the Free Spins an un-limited amount of times during the feature. There are more general casino promotions here. 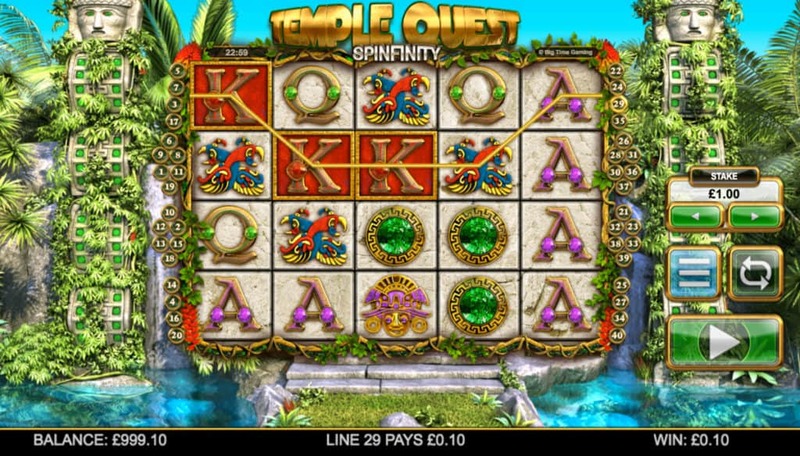 Temple Quest Spinfinity is the perfect example of a Big Time Gaming slot. Incredible graphics, slick animations, a base game with huge potential and an intense bonus feature. What more could you want? Despite it being incredibly difficult to live up to the ‘Spinfinity’ aspect of the game, you’ll be surprised at just how many re-triggers occur during the Free Spins feature. Sure, it can be a volatile game, but there are plenty of opportunities where you can win big. You can see more online slots here, join & spin now and try our mobile deposit here on Easyslots.com.